Tumbled Stones measure 0.3" - 0.8". Hematite is the common name for a wide array of iron oxides. Hematite itself has several varieties, the most common is hematite plates that form as a rose, and the massive botryoidal form which is usually polished into a wide array of shapes. Besides natural deposits of hematite, it can can also be found included in dirt, clay or crystals, usually giving the material an orange to red coloration. Hematite is a supreme weapon against unionized radiation. It is recommended that you wear it in disk or pendant form against the skin when working on or around computers and such. It saturates your aura with an energy that repels radiation. You will find you have much more energy as a result. 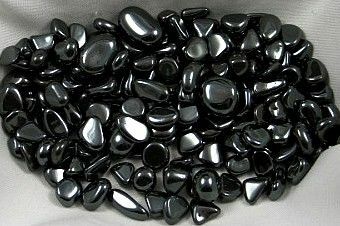 Hematite helps keep you grounded and in the here and now. It cleanses blood and is good for keeping you focused on difficult tasks.